The love of horses is a part of the local heritage in this small town in middle Tennessee. Quietly nestled in gently rolling hills and open fields lined with shade trees, Shelbyville is known as "The Walking Horse Capitol of the World". Dan and Virginia grew up here in the midst of walking horse country, and over the years developed a deep love of these beautiful animals, as well as country life in general. 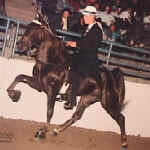 Breeding and raising foals soon became an important part of Dan's life, and for several years he also enjoyed the show ring as an amateur. In the meantime, Virginia's love of animals took form in her pastel and charcoal drawings of them. After Dan and Virginia married, Dan's knowledge of horses and Virginia's creative talents led to the development of Tennessee Horse Country. And more recently the addition of our Bed Breakfast facility, which echoes their love of rural life and animals. You can purchase some of Virginia's art work in the Gift Shop. Both the Guesthouse Cottage were designed and built completely by Dan and Virginia, along with loads of help from a dear neighbor, Donnie Thompson. 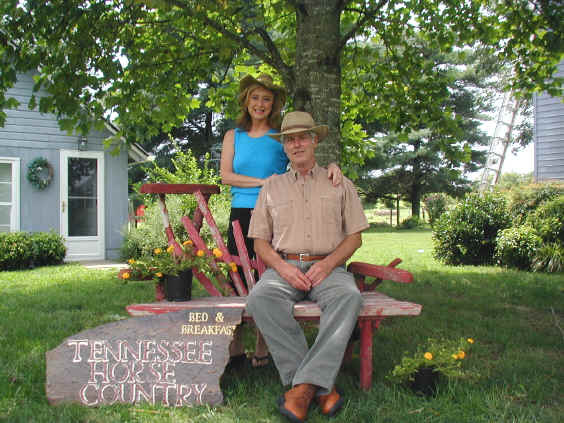 "We take great pride in our place, and hope you enjoy visiting Tennessee Horse Country. Privacy laced with Southern hospitality are what we offer.. We hope you'll come visit us soon and often."